Immanuel Lutheran School participates in the Labels for Education program. 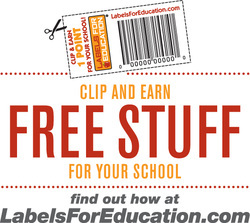 Through this program the school collects UPCs and beverage/sauce caps from participating products to earn points that can be redeemed for free educational merchandise. Our goal is to collect 1000 points that we can redeem for equipment for the school. It’s easy to help – simply save UPCs and beverage/sauce caps from participating products and drop them off at Immanuel Lutheran. To view the participating UPCs and beverage/sauce caps, click on the Labels button.